Sweet! I suggest that the next community project should be an arena for epic battles. Maybe behind the AN sign? Can any of us spawn mobs now, or just El Presidente? Last edited by Atariboy : 2011-01-02 at 11:28. I've started levelling the ground for the Arena and I've marked out the basic dimensions - by pure chance there's a dungeon with a spider spawner just under the North end. My plan is to build steps down to the spawner and put in remotely operated steel doors so we can release the spiders! I was going to make the floor and first two levels of walls out of Obsidian so it was mostly Creeper-proof, but after doing the math, that's somewhere in the region of 2000 blocks of Obsidian! We need to collect any and all saddles we find from now on for pig-back jousting matches in the arena. Agreed? I'm excited to see what's happened while I was away! Back around in Monday, maybe, when I'll start on some audience stands and facilities for the Arena. For now, onwards to Kona! I'm extremely pleased with my automated transit between the treehouse and the ranch - although it sometimes fails to work if there are 2 or more other players nearby. The more Players in the same chunk, the more the minecarts lag. That means the same design may not work in Bridgeport. But I could have a go at putting one in the Bridgeport Monorail station and another at the arena. It'll need a booster or two along the way, though. 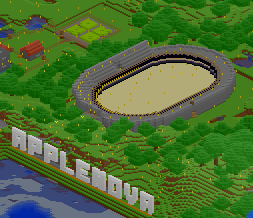 ooh, there should be an applenova coliseum, with different mob spawners behind different gates. Break down the gate and all the mobs rush out, only to find other mobs are the only thing in reach. Cue the death fest while AN minecrafters watch from the stands, high above the mobs. Could even place bets on which set of monsters will win out, zombies, spider or skele's. We actually have built a coliseum-style "arena" with this idea in mind! It even has an obsidian floor to protect the structure from creeper explosion damage. Back when I had hMod running, we tested various spawners in the arena including Skeleton, Zombie, and Monster. Creepers didn't seem to want to spawn from a spawner cube, though, which makes sense because a creeper would just blow up the spawner. Giants wouldn't come out of the spawner, but I could force one to appear anyway like we did that one time in Bridgeport. Well, this idea did come up after someone complained about griefers. Perhaps a new spawn point for griefers instead of banning them? I like that idea. If I could get one of the (several) warp mods working in Bukkit, it might be possible to send a griefer to the area that way. We actually have built a coliseum-style "arena" with this idea in mind! It even has an obsidian floor to protect the structure from creeper explosion damage. I forgot that we also set down a single layer of sand inside to give it a better feel and to improve visibility over the near-black obsidian. You can see that I've started (but not finished) the upper stands for the Arena, as well as building a "Season Ticket Holders" entrance from the hill behind the AN sign. Interesting: I think I might be building something similar next as I'm stockpiling bricks, smooth stone and bookcases! Maybe we could collaborate? I'm looking at building a brick library building with a clocktower (complete with bell). My intention was to base it on the Braithwaite Hall at the Croydon Clocktower mainly because I used to work there (and because the Tory council are in the process of shutting it down...sigh...) so I know the layout really well. Much respect to Brad's texture package as it makes finding clay a lot easier - it looks closer to dirt in colour now, instead of being almost exactly like stone in the regular textures. Fair enough. I guess we will have to scour the map for clay and do battle if we both find the same deposit! I don't actually need *that* many bricks. Lapis is the priority. But yeah, if we find clay at the same time in the same place... it's on. Knowing us, it'll be more of a case of who dies by mistake first. I mean, diamond swords are cool, but there's no coming back from hot magma to the face. Last edited by Kraetos : 2011-02-01 at 13:42. - Two men enter, one man leaves. You go in with no inventory. - There will be 11 chests scattered across the arena, each containing a useful item. The items are: 2 stone swords, 1 iron sword, 2 leather chestplates, 1 iron chestplate, 2 bows w/ 3 arrows, 2 stacks of 10 arrows, and 1 bucket of lava. - In addition, there will be 20 blocks of TNT scattered around the arena. - All TNT and chests will be covered with gravel. You have to dig up the items and risk hitting TNT when you do. - Spectators are encouraged to place bets. Iron, diamonds, lapis, clay, whatever you want to bet. If there's no objection I'll set it up. Obviously if I set it up I can't duel, since I would know where the good items are.... so, do we have two volunteers? Last edited by Kraetos : 2011-02-01 at 15:33. Count me in. Just let me know when. I've been thinking of this too. Can't wait to watch a game. Those seeking clay: I have 10x64+ up for donation. Currently it's all at my castle, but I'll try to remember to bring it east sometime and leave it in the chest near the Bridgeport terminus. Last edited by Kraetos : 2011-02-01 at 15:32. Love it. I'd suggest sand as the chest covering so it blends better with the Arena floor. You'll find spare sand in the Arena Manager's office which is below the foyer - go through the door behind the hotdog stand. I'm still working on the stands, but the Foyer is done, and the VIP Bar is nearly ready too. I'll need to add some iron doors (with switches on the outside only!) to the Arena Entrances and some chests for people to store their gear in there. Maybe In future I'll build a couple of dressing rooms at each end. One question: Won't a bucket of lava be difficult to clean up afterwards? I think there should be a cake in the middle of the floor too. We also need reporters at the Spawn to interview the loser: "I'm sick as a parrot, Dave." PLEASE let us know when the deathmatch is to commence, so that we can all plan to be there and watch the hilarity. Actually all the clay I took from Arteggio is in a chest at the Arena marked "The Wager". Also, any ETA on when the ceremonial opening match at the Arena might occur? Also, someone other than me or Kraetos needs to prep the Arena floor with chests, TNT and sand. I'm happy to do it for matches after this, but we would have an unfair advantage if we prepped this one. I think I filled in the last few items that were missing from the supplies chest. Except cake. Does anyone know if the lava bucket will make a mess we can't clean up? I don't think it would be too difficult — just cover up the flowing parts with sand until you reach the source, then rebucket it. Voilà, lavalessness? I'll contribute some TNT, as I have a ton of sand and sulphur. Will try to do that before tomorrow afternoon, in case then is the first match. And I could make a cake. Just on needed? Since we seem to forget these things, someone needs to take video if it is tomorrow. I work all day. Are chests, TNT, and (one) cake the absolute only things that will be on the floor? I noticed there's lava, TNT, bow and arrows, swords, and sand in the chest titled that of Kraeto's deathmatch. Are swords and bow & arrows being in the floor chests? Is the armor to be out on the floor, or is that strictly Kraetos' (in which cases, opponents can bring their own materials onto the floor, or not?)? I can go ahead and organize the floor, just want to know everything before I organize a wedding and the tables need to be rearranged. 20 TNT randomly placed and buried in sand. Contestants don't take anything into the arena, and enter from opposite ends. Depending on the TNT placement, we might have to get some glass to repair the window into the arena from level 1 after each game. I'll place the TNT and chests tonight. I will, of course, write a small program to determine the locations of each and which chest gets which item. Is the sand on the floor currently 1 or 2 deep? If only 1, I'll go ahead and lay a second layer so it evenly covers the items. All times are GMT -5. The time now is 12:31.